Mary Digges married General Lord Robert Manners (1721-1782), who was an English soldier and nobleman. 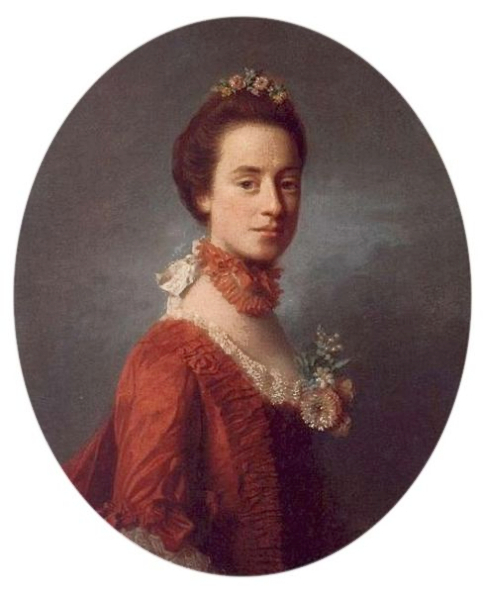 Lady Robert Manners (c. 1727-1829) is the subject of this portrait by the Scottish artist Allan Ramsay (1713-1784). Lady Manners would have 5 children. Lord Manners purchased an ensigncy in the Coldstream guards. He would rise to become a colonel and aide-de-camp to King George II. He would hold a seat in Parliament from 1747 until his death in 1782. The couple were married January 1, 1756. This portrait dates to 1756. One hopes this painting was commissioned by a happy groom to honor his new wife. In this circular portrait, Lady Manners is shown wearing flowers on the bodice of her gown, around her neck and upon her head in a Rococo style. Her dress, perhaps the one she wore for her wedding, is rust-colored as are the flowers that serve as her necklace. To learn more about the artist and some of the other famous people he painted portraits of, please visit our Allan Ramsay biography.